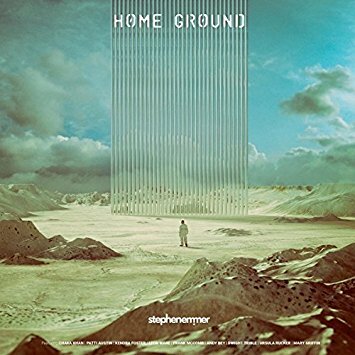 With Home Ground, producer Stephen Emmer has collaborated with a diverse group of vocalists to create a record that is theatrical to its core. However, if you are looking to connect the music on Home Ground to a musical, you might not have a lot of luck. This record is not a soundtrack to a film, nor are these tunes a part of some major Broadway production. One way to view Home Ground is as a soundtrack for the play unfolding before us daily on television, laptop, smart phone and tablet screens as well on in newspapers. That unfolding drama details mass migrations of people seeking to find a new start over after chased out of their homelands by war, environmental disaster, or by crises that while being far more personal and intimate are no less existential. From the standpoint of the immigration debate taking place in this country, this album seeks to give a voice to those looking to carve a piece of home in a place that is not their homeland, and asks the listener to try to walk in the shoes of those who have been pushed or pulled away from all that was familiar. That call for empathy comes through strongly in the urgent “Everybody’s Movin,” a track driven by Dwight Trible’s emotive and theatrical baritone. Trible sings from the standpoint of a person who is a part of one of those mass flows of people seeking to escape inhumane warfare while also having his humanity recognized by the voices talking about immigration on TV. “What we need is not what we’re fighting for/And we all need something/To have or dreams and live our lives in love,” stands as a plea to those in the chattering classes to remember that people – regardless of where they hail from – want the same things. On “God It’s Hot,” Trible sings accompanied primarily by bass and piano, embodying a man who finds himself in seeking human connection as he travels alone, perhaps in a desert, that has become the final resting place for so many migrants. However, the Home Ground’s star is Mary Griffin. Although Griffin has worked with Emmer in the past, she is best known has as singer who 20 feet from stardom as a backing vocalist for legends such as Patti LaBelle. Griffin takes full advantage of Emmer’s decision to have her grab the mic on the tracks “Own Again” and “Place Delight.” The former starts with Griffin singing behind a swinging jazz melody as she tells the story of a woman who is alone in a large city. That jazzy swing transitions into a mid-tempo funk groove and Griffin moves into the one seamlessly. The latter is an enthralling mashup of percussive funk and lush strings as Griffin’s vocals soar through a story of two lovers seeking to find a safe place alone and far away from the dangers on the street. Griffin is a true revelation. Emmer’s empathy for the plight of the world’s uprooted was likely sparked by his experience as a child who traveled the world with his ballerina mother. Her travels took him to India, where he saw the value of diversity and cultural exchange. The lessons that Emmer learned while traveling with his mother and as an artist in his own right are being challenged daily both in all parts of the world, and with Home Ground Emmer and his collaborators have created an eloquent and entertaining rebuttal to the voices of nativism and intolerance. Strongly Recommended.